North Winds Blow! South Winds Blow! Typhoons… Hurricanes… Earthquakes! SMOG! Tomorrow, June 1 marks the official start of the Atlantic hurricane season. 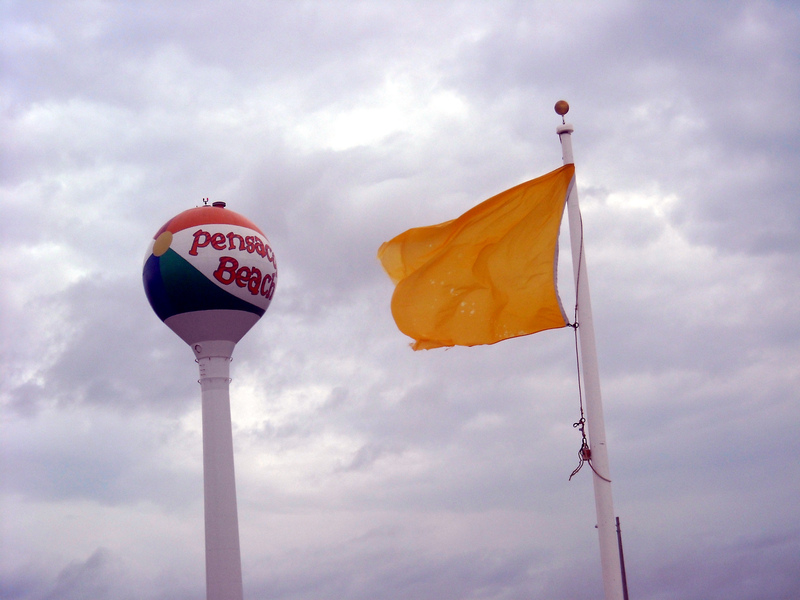 The edge of hurricane Claudette arrives in Pensacola. I realize for many people not living near the coast this fact does not hold much water. But, for those people near the shore tomorrow marks the start of a six-month period of keeping their eyes on the skies and hoping for another year free from the devastation that a direct hit by a hurricane can cause. When I lived in Florida I rode out many hurricanes from about 30 miles inland. That central location meant that by the time the storm reached me it was normally just a wind and rain maker. 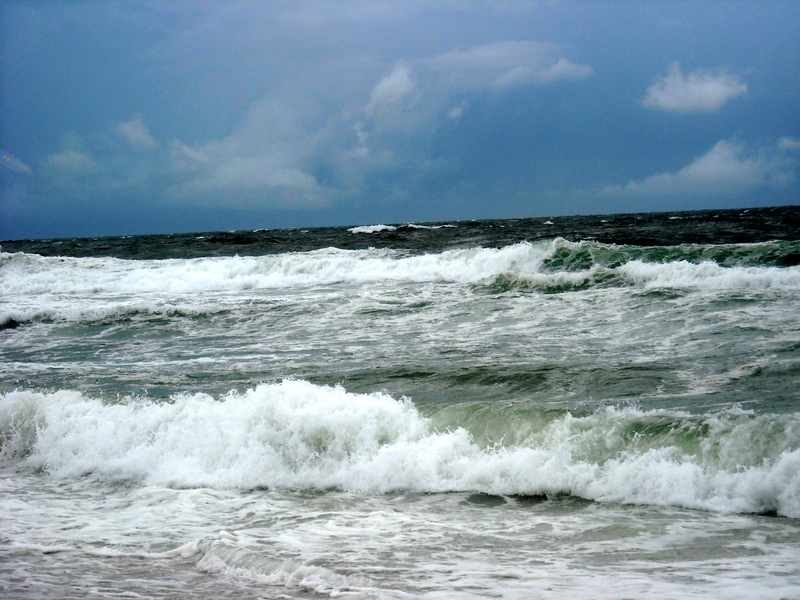 The Gulf of Mexico churns ahead of the arrival of a hurricane. The highlight of those storms being a water spout that picked up a school of catfish and deposited them in my parents’ yard. I can still picture my mom running around trying to save all of the fish that were very much out of water. Since leaving Florida I have had a few vacations cut short due to the pending arrival of storms that I have had to outrun in my car to reach the safety of home and avoid getting stuck. To that end I try to avoid travel during the peak of hurricane season now to minimize the chances of having a trip washed out. Upon moving to Texas I came a little closer to the shore through my proximity to Galveston Bay. 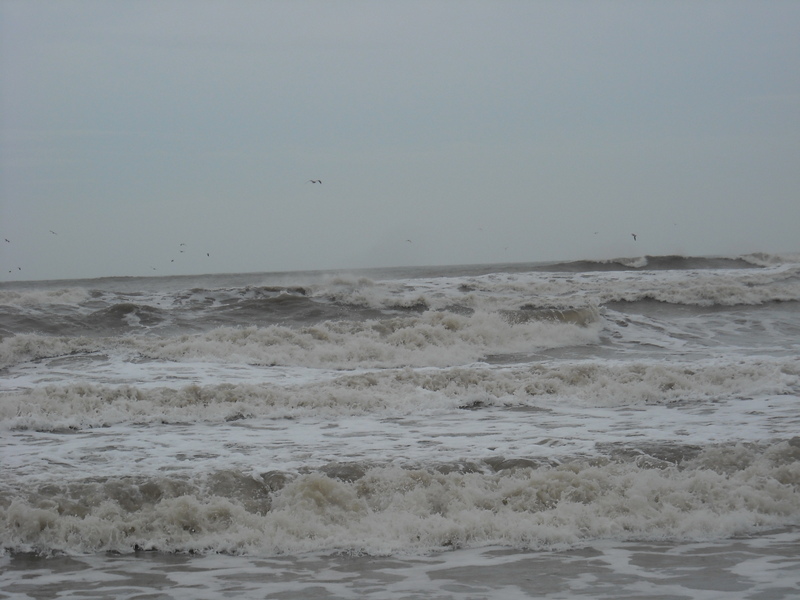 While still around 30 miles from the Gulf of Mexico the Bay acts as a direct line for storm surge as demonstrated during Hurricane Ike. 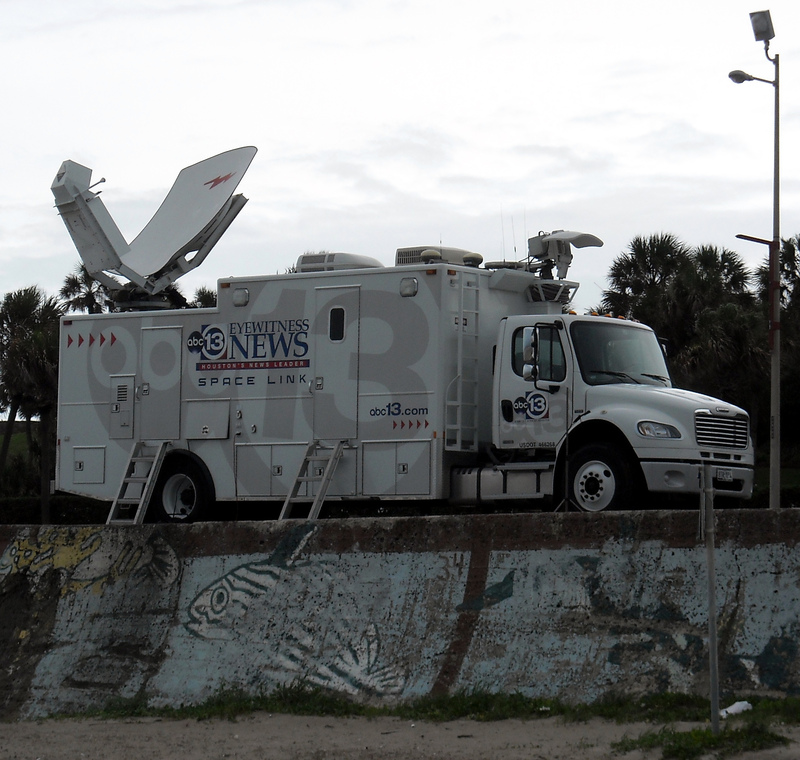 Like moths to the flame news vans like this one on the Seawall in Galveston become a familiar sight before and after the arrival of a hurricane. In the little over a decade that I have lived in Texas I have evacuated ahead of the storm twice. The first time included a 17 hour drive to Irving (a drive that normally would take five hours when not ensnared in bumper to bumper traffic) and a more reasonable seven hour drive to Gulfport, Mississippi during the aforementioned Hurricane Ike. Hurricane Ike marked the closet I ever came to losing everything to a hurricane. Ike made landfall right at the mouth of the Bay which allowed the floodwater and storm surge to push well inland. When I returned back home I realized that the damaging floodwater stopped a mere two miles from my house. 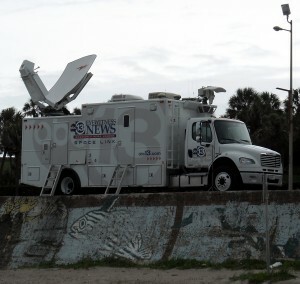 While waiting out the storm in Gulfport I was glued to the television set watching the coverage of the pending storm. Ironically by evacuating east for the storm I actually experienced some of the outer bands of Ike in Gulfport before it made landfall in Texas. Returning back home was like driving through a foreign land. There were still familiar sites but the parts of buildings strewn everywhere made it clear just how powerful the storm was. A news van from New Orleans waits for the storm to hit in Pensacola. One particular comment from the reporters on the seen was the proclamation that the Galveston Hooter’s restaurant was gone. Truth be told, the Hooter’s was one of many buildings perched on stilts above the water that were picked up and tossed onto the seawall like Tinker Toys. But for whatever reason the reporter on the scene felt that the most prudent way to help the viewers at home understand the scope of the damage was to focus on the loss of the Hooter’s. The singling out of the Hooter’s made me laugh for some reason which may have just been a coping mechanism since I did not know what I would be coming home to. To this day when I am driving along the seawall I will stop at the spot where the Hooter’s once stood and in my best Anderson Cooper voice will proclaim that the Hooter’s is gone. 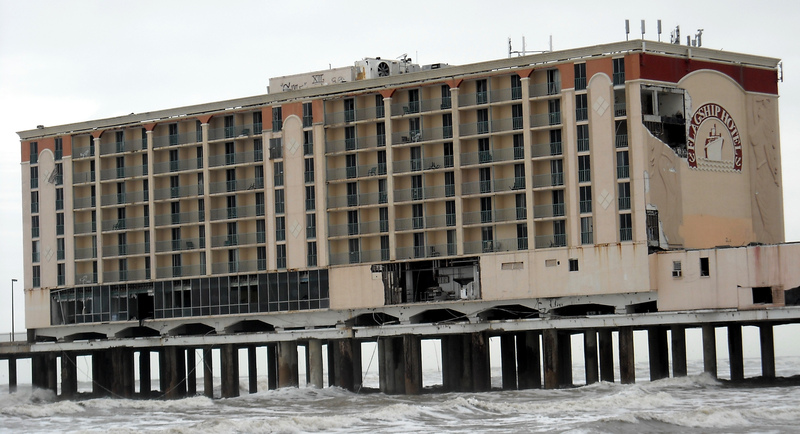 Much like the Hooter’s restaurant the 61st Street pier fell victim to the pounding storm surge of Hurricane Ike. 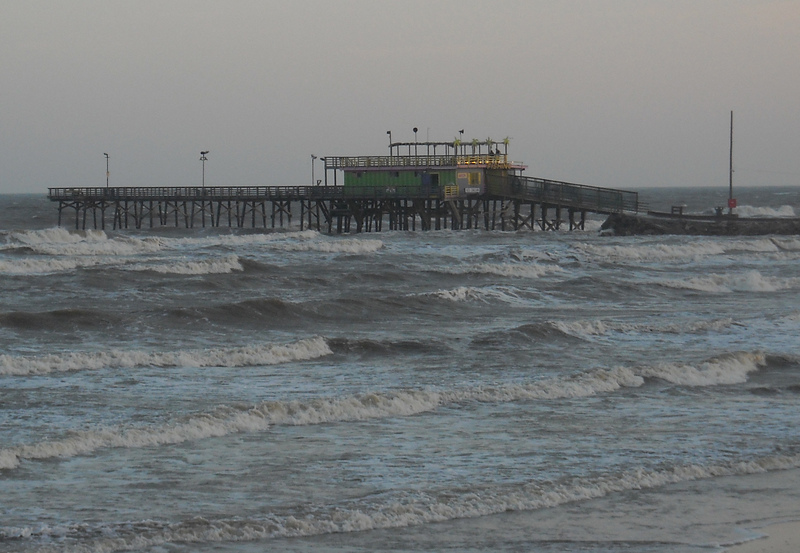 While the Hooter’s has yet to be rebuilt a new version of the pier has returned to the shore. After Ike the area around me rebuilt and for the most part there are few signs of the furry of the storm. 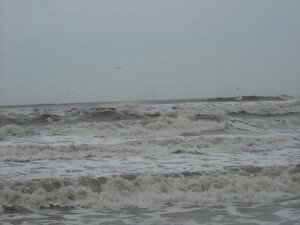 There are still pockets that have not come back and individuals still dealing with the loss but by and large a first time visitor to Galveston would not really be able to tell that a storm had flooded so much of the island. The same is true in other places that have had storms hit. After the water recedes the cleanup begins and lives are slowly put back together. 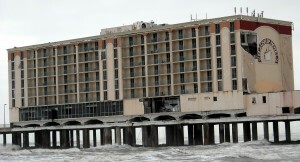 The Flagship Hotel in Galveston was another victim to the power of Ike. 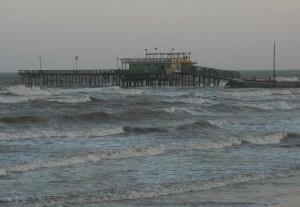 The area has since been converted to the Galveston Historic Pleasure Pier. With the exception of Super Storm Sandy it has been a few years since a storm of the major category has made landfall in the United States. Here’s to hoping for another year where the big storms stay away. But if a storm does head this way this year I think I will most likely ride it out. It is not that I am being brave or foolish for that matter it is just that after seeing the worst that a storm can do from afar I would rather be up close and relatively safe than battling the thousands of people on the road heading north. Now if you’ll excuse me I am off to check my hurricane supplies. It occurred to me the other day that watching this year’s version of the Houston Astros is a lot like watching the Keanu Reeves cinematic classic The Replacements. Granted aside from the Matrix Trilogy the words “Keanu Reeves cinematic classic” are rarely used but stay with me here. In The Replacements, which came out in 2000, Reeves plays a “replacement” player who crosses the picket lines and leads a rag tag group of washed up players on the Washington Sentinels to victory during a NFL strike. 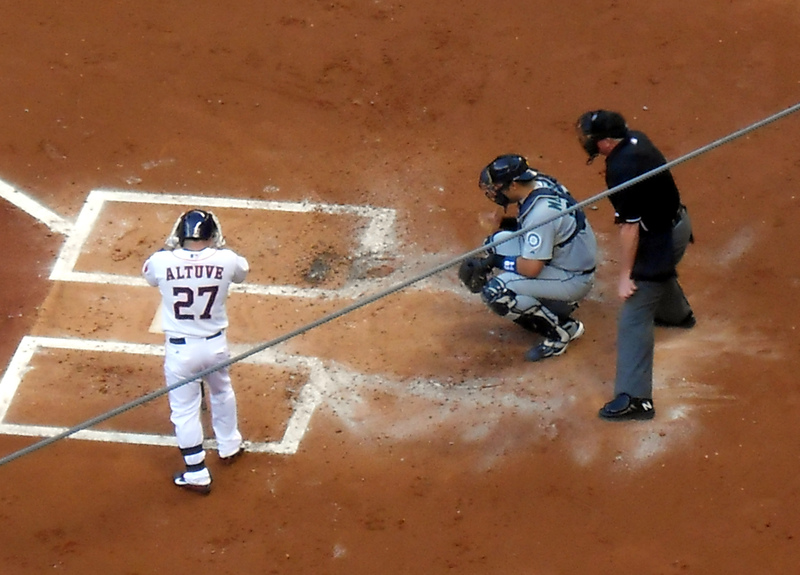 Jose Altuve, the current face of the franchise, is likely the only current Astros player with a chance to see the rebuilding effort all the way through. The movie is based on what occurred during the 1987 NFL season when the regular players walked out and replacement players were used for around a quarter of the regular season. During the strike games the Washington Redskins, portrayed as the Washington Sentinels in the movie due to the NFL rarely giving permission to use real team names in movies, had a 3-1 record. The Redskins would ultimately win the Super Bowl over the Denver Broncos. As a show of thanks and support for allowing them to get there each of the replacement players was given a Super Bowl ring by the Redskins along with the regular players. So what does a movie based on actual events that occurred on a football field over 25 years ago have to do with the Astros today? I am glad you asked. While there is not a strike in Major League Baseball this year the parallels to the movie ring especially true for the men in orange and blue. Much like the “replacement” players of old, the current Astros for the most part of serving as placeholders keeping roster spots warm until the real players return. It is no secret that when the magic rebuilding project that the Astros have started is completed in 5-10 years very few, if any, of the current players will still be with the team. This is not to say that there are not some good ballplayers on the team but is more of a reflection on the focus on building prospects through the draft and building for the long term. After tasting the World Series with the Tampa Bay Rays Carlos Pena is among the handful of “replacement” players being used by the Astros while their future players season in the minors. Of course, no team can just take 5-10 years off while it rebuilds so a roster of players was constructed to be just competitive enough to not embarrass the team while coming at a fraction of the cost of most other Major League rosters. This is not to say that the team is incapable of winning. Much like the 1987 Redskins and their replacement players, the chips will fall in the right spots and the ball will tend to bounce favorably now and then for the Astros. In fact the team has already won more games this year than many thought they would despite racking up serious frequent flyer miles between Houston and the Triple-A affiliate in Oklahoma City with nearly daily roster moves. 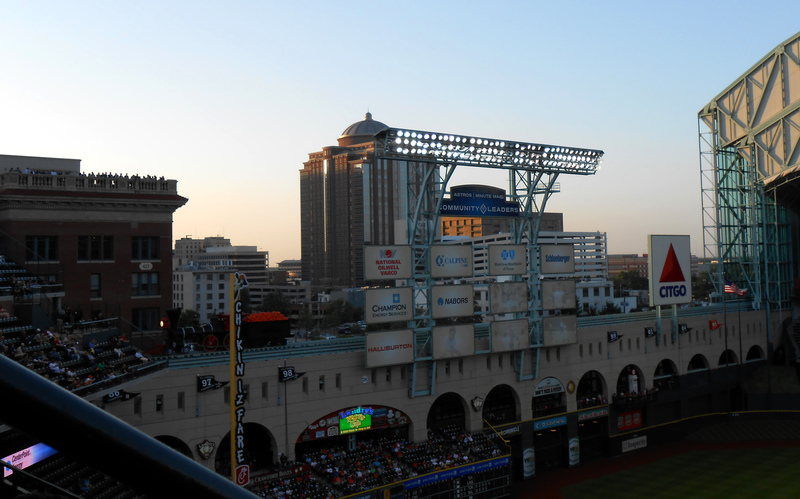 Sections of empty seats are likly to be a sign at Minute Maid Park for many years to come as the Astros work on a total tear-down and rebuild philosophy. And contrasting the preseaon predictions that the Astros would be the worst team in baseball this year the Miami Marlins actually have a worse record than the Astros despite having more so called Major Leaguers on the roster. At the time of this posting the Astros have two more victories than the Marlins. Time will tell who really gets crowned worst team in baseball at the end of the season. Of course if the goal really is to stock the farm teams with the most draft picks the Astros best not get too good too soon and risk missing out on that number one draft pick. That is not to say that the Astros, or any other team, would ever throw a game but only the team with the fewest wins gets to pick first. This year that battle will definitely be between the Marlins and the Astros with no other teams in the same zip code of futility. It just goes to show that one can never truly be sure what will happen despite what all of the so called experts predict. There is still time for a flurry of roster moves between now and the end of the season and Bo Porter doing his best Gene Hackman impersonation could manage to field a competitive team but remember that these are not the players that the franchise is building the future on; they are just the replacements. Of course that doesn’t mean that the Astros and the Marlins for that matter are playing any less hard than the players on the other 28 teams. It just means that the deck is stacked against them and they are swimming against a strong current. Now if you’ll excuse me, I think it might be time to stage a mini Keanu Reeves film festival. Or as Bill and Ted would say, “most excellent” (cue air guitar moves). The Houston Astros won two out of their last three games this week and truth be told, aside from an epic collapse by the bullpen, they should have won all three games against the Kansas City Royals. That is not however what is making the national news as a so called “citizen journalist” broke open a scandal that led to the firing of one man and a collective community wondering whether the event was one that was isolated, or one that had been more wide spread and put them at risk. I am of course talking about Operation Snow Cone at Minute Maid Park where a food vendor was literally caught with his pants down with a partial tray of snow cones in harm’s way while he took care of the call of nature in one of the facilities at the Ballpark. 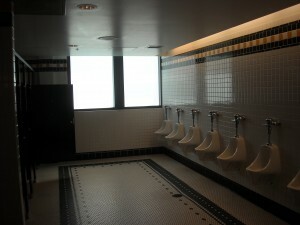 A bathroom at Minute Maid Park. Note the lack of snow cones as it should be. Go ahead and get all of the juvenile clichés about not eating the yellow snow and the team not having a snowball’s chance this year out of the way, I will wait. Okay, now that we have all gotten that out of our systems let us focus on the real issues here. There is no excuse for a food service vendor taking product into the bathroom and placing it on the floor while they go to the bathroom a few feet away. The amount of germs and the risk of exposure to those germs by the innocent purchasers of the product is certainly not something anyone wants to be exposed to. But let us say for the sake of argument that the three remaining snow cones in the tray were on their way back to the vending area to be destroyed at the end of the shift and were not going to be offered up for sale. We just don’t know what the plans for the snow cones were after the flush heard round the internet was completed. Another factor that cannot be ignored here is what in the world was the person doing taking video and providing running commentary inside the restroom in the first place? A vendor sells cotton candy and kettle corn at Minute Maid Park. People who take video of people under bathroom stalls in most cases are called predators and/or creeps. These people usually end up getting arrested on peeping tom charges or at the very least they get visited by that To Catch a Predator guy. Granted, the intentions of this phone camera wielding justice seeking individual seem noble but I really don’t want to encourage a whole slew of restroom rangers to enter with cameras blazing looking for something amiss. What next hidden cameras in the urinal cakes? With all of the camera phones and security cameras out in the world today it is safe to assume that at any given moment whatever you are doing is being filmed by someone. In fact, someone very well could be taking video of me writing this column. That is just the new reality that we are faced with as a society and I see little chance of that genie ever getting put back in the bottle. I just don’t want to think that it now includes the possibility of being filmed in restrooms as well. Instead of filming under the stall door, which just sounds creepy no matter how you slice it, the concerned fan could have just located a team employee to alert them about what was going on. 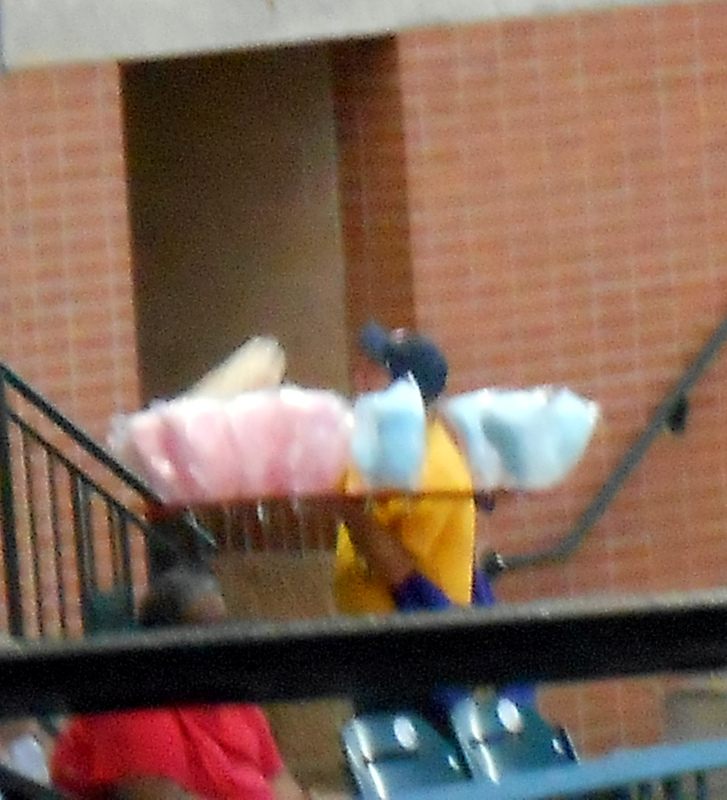 According to the video of the incident a stadium employee does appear to get involved and the tainted snow cones do not make it back out on the floor. As part of the damage control afterwards it was announced that the vendor in question, who worked for a third party contractor, was fired. I am sure the remaining employees will be reminded of the importance of not taking food into the restrooms as well. Various vendors in bright yellow shirts work the crowd before a game. I have said time and time again that I never wanted to work in the food industry since I enjoy eating out too much and wanted to remain blissfully ignorant regarding what was happening to my food behind the curtain. But I am fairly sure that they cover don’t take the food with you into the bathroom stall with you during orientation. In the spirit of full disclosure I should reveal that over the years I have had many snow cones at many ballparks, including quite a few at Minute Maid Park. 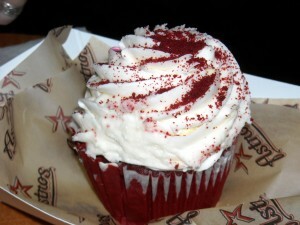 And despite this lapse in judgment by a former employee I am no less likely to continue enjoying them at the ballpark. Of course, I will continue my habit of only ordering the snow cones from full trays that have just left the backroom where they have been made. Once the tray has taken a few trips around the ballpark it is no longer considered appetizing in my eyes and is considered unclean. The image of a tray of snow cones on the filthy bathroom floor of a Major League ballpark is certainly disgusting but I have to believe it was an isolated incident. When in doubt cupcakes make a lovely food choice. And while we are on the topic of phones in bathrooms can we finally put an end to people taking calls while they are relieving themselves in public restrooms? No one is that busy, or that important that they have to take calls in the stall. Checking your e-mail, surfing the web and texting while in the bathroom is perfectly acceptable and really is no different than reading a newspaper or a book to pass the time. But for the love of Pete do not answer the phone to discuss business while doing your business in public. If I am on the other end of that call and I hear the telltale signs of where they are while making the call I am going to be even less likely to employ their services. Keep the phones outside the stalls people. To paraphrase the anti-texting while driving campaign, it can wait. 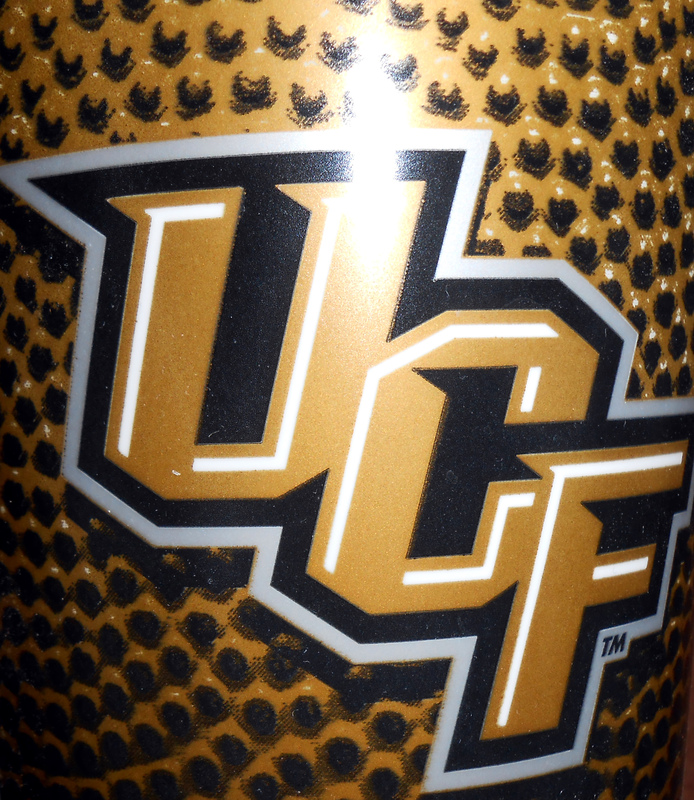 Now if you’ll excuse me, all of this talk about snow cones has me craving something cold and refreshing. Events like the recent tornado in the suburbs of Oklahoma City show the insignificance of sports in the grand scheme of things. 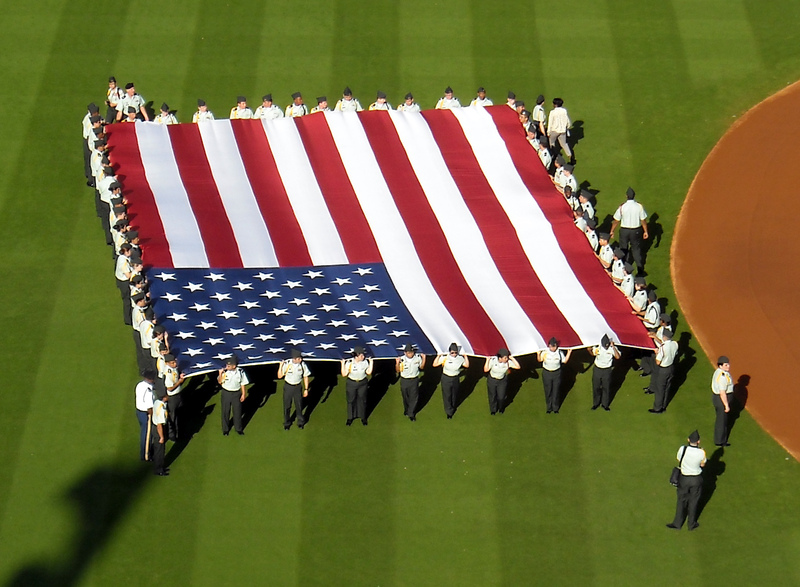 Events like the recent tornado in the suburbs of Oklahoma City also show the significance of sports in the grand scheme of things when it come to returning to normal following a tragedy. FEMA command centers like this one will soon be a sight all over Oklahoma. While nothing can instantly make everything better for those who have lost loved ones, a lifetime of possessions, and are trying to rebuild their lives while wondering why the same area would get hit by devastating twisters roughly a decade apart, the presence of sports can have a soothing effect while also serving to bring resources to the recovery that may not have been there otherwise. Today across the country college baseball teams will start their conference tournaments to determine who makes it to the College World Series. In the Houston area that means the Southland Conference and Conference USA will be holding tournaments at Star Tex Field in Sugar Land and Reckling Park at Rice University respectively. 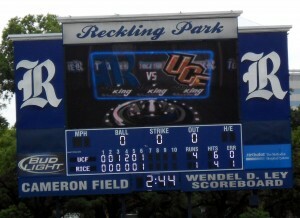 UCF and Rice University are set for a showdown with the Conference USA crown at stake. Another tournament for the Big 12 was also slated to start today in Oklahoma City. The stadium hosting the tournament, which is also home to the Houston Astros Triple-A affiliate, is about 10 miles from the devastation area. 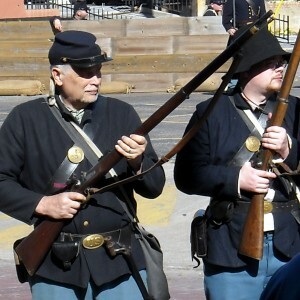 With such close proximity to the devastation tourney directors were faced with deciding whether to go on with the tournament, or to cancel it altogether. In the end they decided to delay the start of the tournament by a day to add time to recover. In situations like this there will always be those who say the tournament should have been cancelled in light of the tragic events and to hold the tournament is being insensitive to the victims. I do not share that opinion. During an active event where resources were stretched to the point where holding the tournament would become a strain to the cities hosting them then of course I would say to cancel the tournament; but this is not the case. Public officials from the governor down to the mayor have expressed a desire for the Big 12 Tournament to continue as planned so it is not like the Conference officials are proceeding without the blessing of the proper authorities. 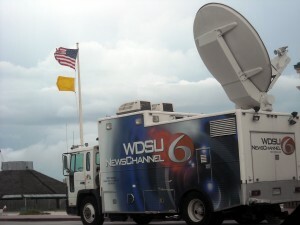 Stories are already reaching the media of teams chipping in to help the victims of the storms. Were the tournament cancelled those teams would not still be there to help. One such example is the University of West Virginia baseball team going to Walmart and buying items to distribute to the victims. 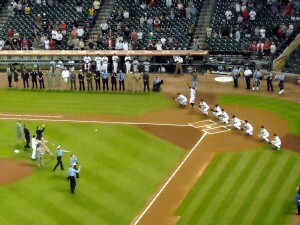 There are likely many other gestures that are being done by teams that are not being publicized. In addition to the efforts of the universities taking part in the tournament, it is likely that donations will be taken at the ballpark as well to help the victims. There is also a very strong likelihood that portions of the ticket sales will go towards the victims. While many people may want to donate, a collection box at the ballpark gives them an easy way to do that. It is the same way that the annual Salvation Army Red Kettle Campaign does so well. 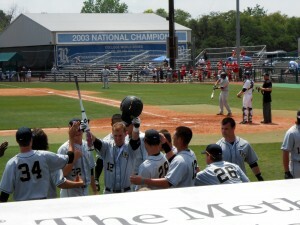 UCF won the series during their last visit to Rice University in April. They will hope for similar results this weekend. None of these things could happen if the tournament was cancelled so the value of the show going on becomes evident. I believe that by and large people want to help out in times of trouble but many may not know how. By making it as easy as possible for them, they are able to contribute. In the spirit of making it easy to contribute to the relief effort, people can make an automatic $10 donation to the Red Cross by texting REDCROSS to 90999 or the Salvation Army by texting STORM to 80888 . While by in no means are these the only organizations collecting they are certainly two places to start. It will likely take years for the areas hit by the tornado to recover but as they have shown from the time of the Dust Bowl to today the people of the Midwest are a resilient people and ones that can recover from adversity stronger than before. Stories of heroic actions by teachers shielding their students with their bodies as the storm tore through their school, to pets being reunited with their owners, show some of that never say die attitude and willingness to help others in their darkest moments. Sadly there were lives lost in the storm but early warning systems provided a critical 16 minutes to allow those that could to seek shelter. Few can argue that the 16 minute warning saved lives that would have been lost with less notice of the approaching tornado. Personally I would rather face hurricanes than tornadoes. At least with hurricanes there are usually days if not weeks to prepare for the impact. Tornadoes do not offer that luxury and are a major reason why as much as I love the suburbs of Dallas, and even picked out a loft overlooking a ballpark that I thought would be fun to live in, I do not think I could ever live there due to it being part of Tornado Alley. Hurricanes announce their arrival days in advance unlike tornadoes that strike in an instant. I have definitely gone through my share of hurricanes and have seen first hand the devastation that they can cause but it is nothing compared to what a tornado can bring. I hope to never have to face a tornado head on but if I ever do I will know that sports will be there as a calming factor as I rebuild from the devastation. So let the games go on as the recovery from the tornado takes place and know that the rebuilding will still be going on long after the stadium lights dim but the people of Oklahoma will recover as they have many times before. After all, it takes a certain kind of person to live in a zone where on any given day everything they know can be turned upside down in an instant. And while they are adversaries in the annual Red River Shootout between the University of Texas Longhorns and the University of Oklahoma Sooners, there are definitely times to put football partisanship aside and just be one human being helping another. And this is one of those times. Now if you’ll excuse me I am off to get ready for the Conference USA Tournament at Rice University but first I have a donation to text. Tis the season when new graduates of all shapes and sizes will enter the world. Some will enter the workforce and start the task of paying off student loans that are in some cases way more than what their incomes of their chosen fields will cover. Others will continue adding to those student loans by going to graduate school or culinary school or any other thing with school in the title to delay the clock on paying off those student loans. For others this is the time to graduate from high school and start the journey to college and the accumulation of those aforementioned student loans. Although it is season for commencement addresses for some reason no one asked me to give a a speech to any graduating classes this year. Of course truth be told that has been the case for many years but that is certainly not for lack of trying on my part. 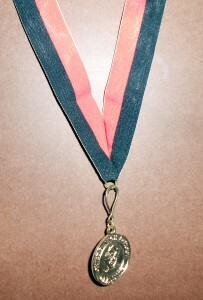 It is the time of year where students of all ages will be sporting graduation bling like this medal. Ever since my high school graduation I have thought that it would be nice to help send a graduating class off into uncharted waters armed with my words of wisdom and encouragement. Commencement speakers hold a special place in the memories of graduates and I have wanted to add my name to that fraternity of memorable speakers. Why I remember my commencement speaker in college just like it was yesterday. I mean, I remember what he looked like, and some of what he said. I am sure if I dug up my commencement program I could find his name. So I wanted to be that person that students look back on with fond memories of inspirational words. During my career working at a college I attended many graduations. I served as the official photographer for several of them. I even attended graduations inside a state prison which I must say is a rather interesting occurrence as one might expect. Still despite my waiting in the bullpen to step up if the speaker had to cancel for illness or inability to fit into their gown my number was never called. In the event that my number was called I envision a typical conversation of people reflecting on those inspirational words going something like this. Chad: Boy, that was such a good speech that old what’s his name gave at our graduation. Tad: We had a speaker at our graduation? Okay, so the commencement speaker is not remembered by everyone. I think part of that has to do with graduation caps cutting off blood flow to the brain. I have no proof of this, but it is a pretty logical explanation if you ask me. Once one graduates from college they are often bombarded with requests to “give back” to their alma mater’s annual fundraising campaigns. A small price to pay for a diploma I suppose. Still, despite the short term memories of graduates, I thought for sure that this would be the year that I would get the call to share my insights with graduating seniors. Speaking at my alma mater’s graduation was ruled out this year when President Bill Clinton accepted the gig but surely there were other colleges that needed a speaker who would work for an honorary degree and sugar cookies. Alas the phone did not ring and I was left with a speech and no audience to hear it. No worries though I will just share a version of my remarks dedicated for pomp and circumstance here. Of course, this is the abridged non sugar cookie and honorary degree version. I need to leave something out just in case I get called to the big time. So without further adieu here goes. Students you are to be commended for your efforts in reaching this momentous occasion of (high school, college, preschool) graduation. Looking out at all of your caps and gowns I am reminded how silly people look in caps and gowns. I mean seriously who came up with the idea of dressing up like Supreme Court justices as a way to commemorate graduation? This day marks the end of one chapter of your life and the beginning of another chapter. Hopefully the next chapter will not be like the last chapter of a John Grisham book though. I mean is it just me or does he totally lose steam in the closing chapters of all of his books and sort of just phones in the ending? Enough about John Grisham and his limp final chapters. You have the whole world at your fingertips and it is finger lickin’ good. Now is the time of your lives where you can have experiences that will last a lifetime. Don’t be afraid to step out on limbs occasionally and try new things. While the limbs will sometimes break, they will usually just bend. Never say, “I’ll never go to Graduate School so it doesn’t matter what my GPA is.” Graduate School shows up when you least expect it and yes they do care about grade point average. So hats off to the graduating class of (insert year and school name). In conclusion remember that life is a highway and you want to ride it all night long. No wait, those are the lyrics to a really bad song. Let me try again. Life is like a box of chocolates…no that isn’t quite right either. Anyway, in conclusion, I guess it is good that no one asked me to give a commencement address this year. I will be ready next year though so be sure to book my services early. Now if you’ll excuse me, I have a speech to write and sugar cookies to eat. In one of the worst kept secrets since the invention of the secret, the Houston Astros are set to officially announce today that they have hired Reid Ryan, son of Hall of Famer Nolan Ryan, to be their next team president/CEO following the sudden resignation of the last team president earlier this week. Nolan, the Ryan most fans would have loved to welcome back to the Astros fold, currently serves as president of the Texas Rangers and owner of the two Minor League teams that son Reid oversees. So, the Astros will hope that Reid can weave some of the same success that he has had with the Triple A Round Rock Express (Rangers affiliate) and the Double A team Corpus Christi Hooks (Astros affiliate) with his call up to the Majors. Whataburger Field in Corpus Christi is home to the Hooks which is one of two Minor League teams run by incoming Astros president Reid Ryan and his father Hall of Famer Nolan Ryan. 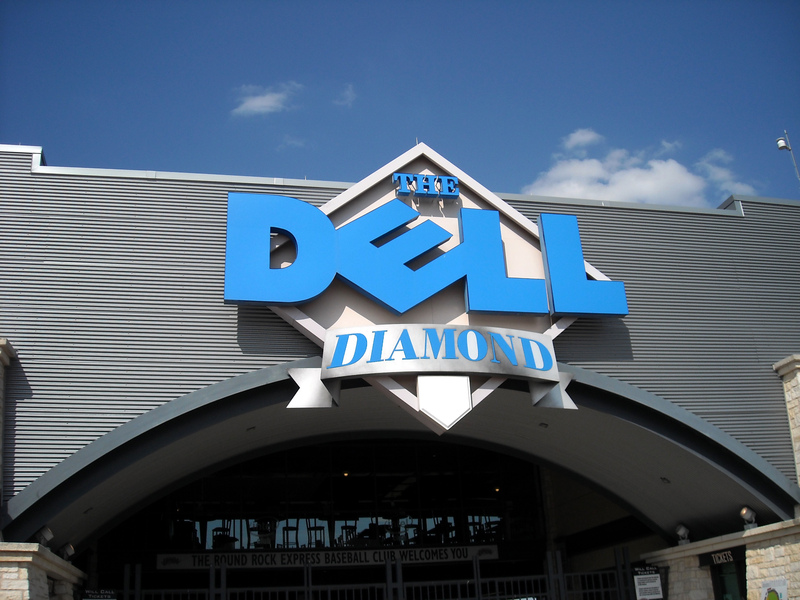 I have attended games in both Round Rock and Corpus Christi and did enjoy the overall experience. How much of that was related to the influence of the father and how much of it was based on the son is up for debate but few can argue the quality of product being put on the field. And with years of running a pair of successful franchises behind him it seems some of that knowledge will translate to running a dysfunctional franchise like the Astros that seems to take more steps backward than forward. 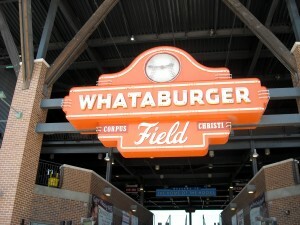 Of course, in all honesty I much prefer the Ballpark experience that the Pensacola Blue Wahoos and the Frisco Roughriders provide over my experience at Reid Ryan’s Ballparks in Corpus Christi and Round Rock. But if one truly buys into the Astros public relations campaign of this being a time to strip the team down to the foundation and rebuild, than the move to hire Reid Ryan fits right into that plan. With the team being 5-10 years away from being competitive by most estimates that gives Reid Ryan time to learn how to be a Major League Baseball team President. 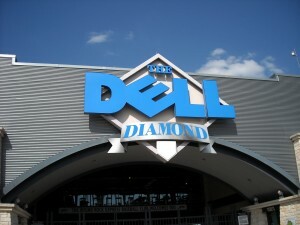 The Dell Diamond is home to the Round Rock Express. Incoming Astros president Reid Ryan ran the Express with his father Nolan. 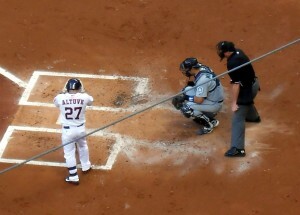 To be fair, I am not alone in assessing the talent on the Astros roster and calling it Triple A level. 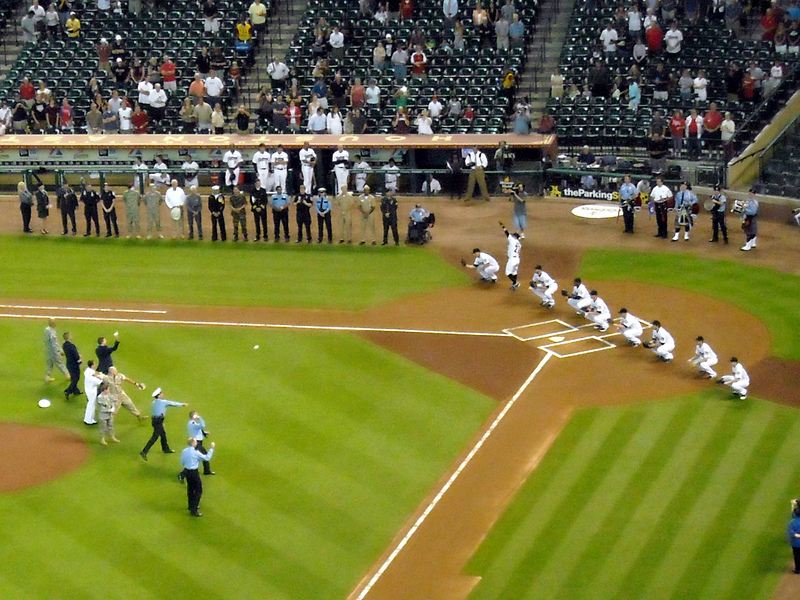 With mandates to minimize costs coming down from the top the baseball side of the house tried to put out a quality roster on the field but with the amount of money they were given to work with it is not going to be the same level of competition of the other 29 teams when you are spending less for the whole team than many other teams pay single players. That is not to say that the Astros won’t get lucky here and there and manage to put a win together. In fact a quarter into the season they have managed 10 such victories. After all even a broken clock is right twice a day. So with a roster that is a moving target full of players that would still be in the minors on any other roster, and expectations for winning being as low as they are, the pressure for Reid Ryan to succeed right away would be rather low in theory allowing him the chance to proceed slower than someone taking a job at a team that was expected to win right away. It is more likely that he will be given marching orders to try to press the flesh as it were and to mend broken fences and ill will in the community while the baseball product catches up to the Major League level. And of course with expectations set so low in the event that he can’t right the ship few would hold that against him when he applied for other jobs. So, it really is the perfect opportunity to try some things out without committing career sabotage. Of course the famous last name also provides some protection that others would not have in terms of career protection. And having a famous father in a similar position four hours up the road that can be called for advice doesn’t hurt either. 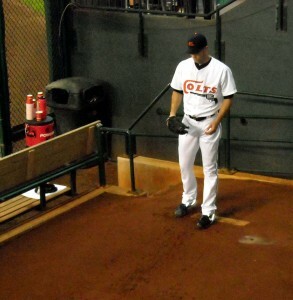 I do hope that the rebuilding effort works out for Ryan and the Astros. The process to date has been painful to watch on several fronts. 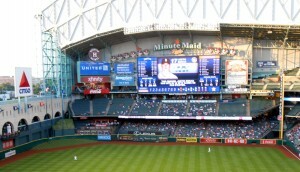 If I ran the Astros the eyesore billboards in the outfield would go away. Here’s to hoping new team President Reid Ryan shares that view and restores the skyline view in Minute Maid Park. The Public Relations major in me cringes at every misstep that the team makes. And for goodness sake find somewhere else in the ballpark to put those gaudy community partner billboards that block out the train and the skyline. You have a stadium that offers great views of the night sky and then you go and block them with signs. Seriously? And the whole charging fans excessive amounts of money for seats while failing to field a product worth seeing at those prices should be declared a crime. Then there is that whole television debacle with only 40 percent of the Houston market getting to watch the games on the new Astros channel. The channel is supposed to be a revenue source for the team to allow them to spend money on players but so far that has not come to pass. There are several other challenges that will face Reid Ryan when he takes the helm but those are certainly some of the more challenging ones that come to mind. Of course when one gets tired of waiting on the Astros to get competitive again they can always catch the Sugar Land Skeeters in action. The Skeeters currently hold the best winning percentage in all of professional baseball. Did the ownership of the team under estimate what it takes to own a Major League Baseball team? Perhaps. Can all of the missteps and public relations faux pas be fixed to allow the disenfranchised fans to return to Minute Maid Park to once again watch competitive baseball being played by the home team on a consistent basis? Time will tell. 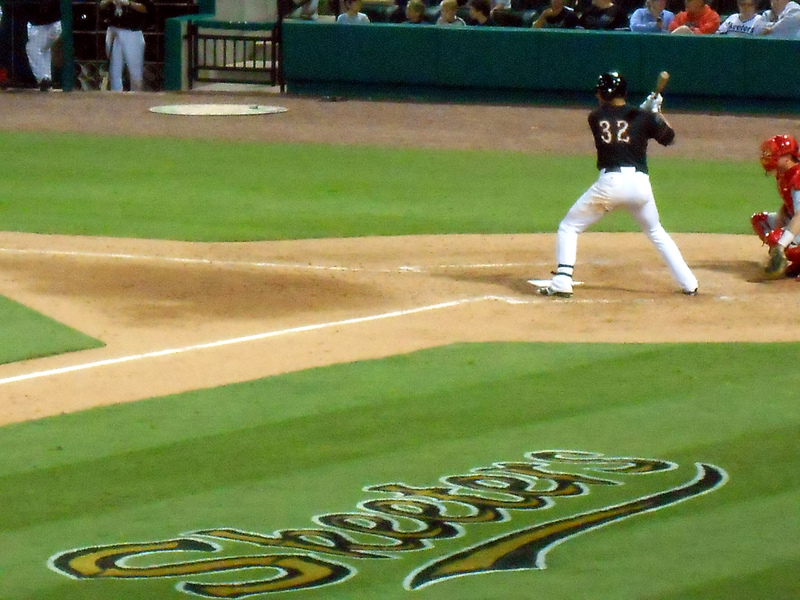 Until then, there is a team in Sugar Land called the Skeeters to watch. I am also one of the lucky 40 percent who has the new cable channel so I can watch the Astros from the comfort of my own home without paying Major League prices to watch Minor League talent. I can also watch the Texas Rangers each night so I am thankfully not going through baseball withdrawal during the epic Astros slump. Now if you’ll excuse me, all of this talk about Minor League Baseball teams, and teams playing like Minor League teams has given me a sudden urge to go up to Frisco to catch the Roughriders. To Fly, or Not to Fly? The other day there was an announcement on a tarmac in Pensacola, FL that got my attention. Sadly, it was not the announcement that the Blue Angels would once again resume their schedule of air show performances that had been cancelled for the remainder of the year. This tarmac announcement was east of where the Blue Angels fly but it did involve blue planes albeit ones that are a bit larger. 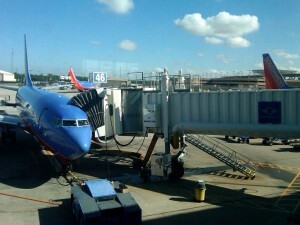 Southwest Airlines will fly non stop from Houston to Pensacola starting in November. The announcement in question was that starting in November Southwest Airlines would offer nonstop service from Houston to Pensacola. Now I realize that this announcement of better flight options will probably only interest a select few Triple B readers. 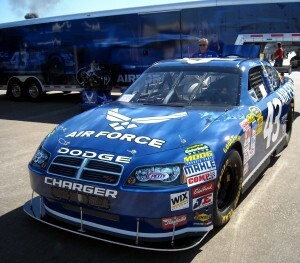 Primarily the interested parties will be those located in Houston with a desire to fly to Pensacola. Previously if I wanted to fly to Pensacola from the closet airport to my house it would involve flying over my destination, switching planes in Atlanta and then back tracking until I landed where I was wanting to go. Depending on the layover between flights in Atlanta this option could actually end up taking as long as it would take to just drive there. 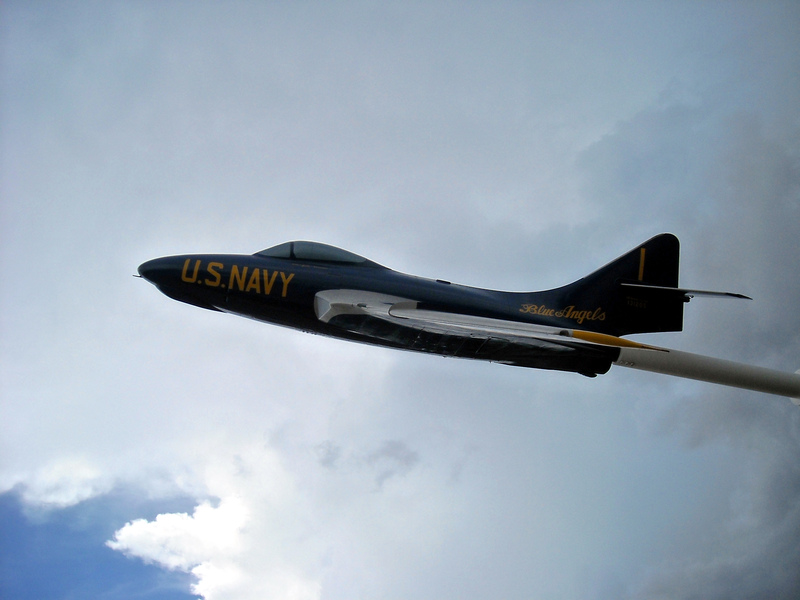 Blue Angels jet at the Florida Welcome Center. As mentioned before, Pensacola is one of my favorite go to spots when I need a quick fix of Florida sun and sand. 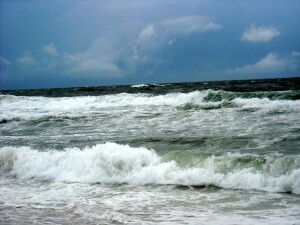 By car it is around nine hours from my doorstep to the sugar sanded shores of Pensacola Beach. 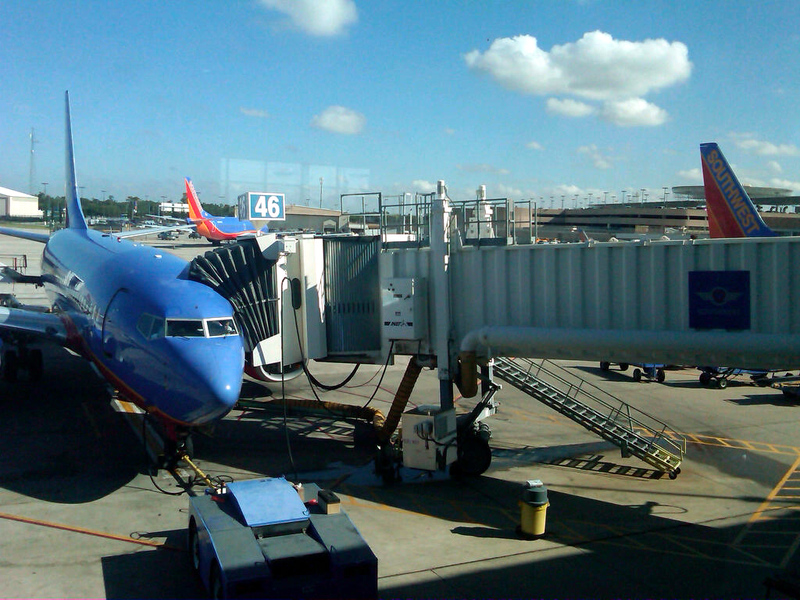 A plane ride on a Boeing 737 with the words Southwest on the tail would take significantly less time. But that begs the question when is a plane ride better than a car ride? While the plane option is certainly the winner when it comes to getting there the fastest it would involve increased costs and the need for a rental car once the final destination is reached. Planes also involve getting squished up against people that you probably would not want to be that close to in normal situations. 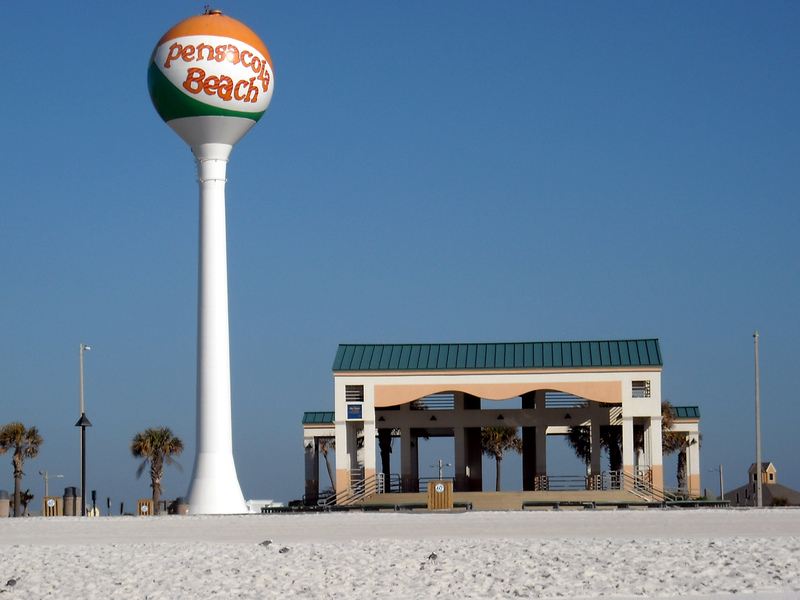 Pensacola Beach is now just a Southwest plane ride away but driving still has its benefits. In terms of safety of air travel versus car travel, statistics show that one is far more likely to be involved in a car accident than a plane crash so the whole danger of flight argument is pretty much tossed out the window. With a car ride the driver can control the pace and stop as often as they want without inconveniencing 100 other passengers. So as much as I have longed for the day to come when I could travel nonstop by air between my house and the beach, it just doesn’t make sense to do. There are other reasons why it is preferred to drive as opposed to fly for me. The most glaring of these reason is I really enjoy a good road trip and for the past 13 years or so I have made the drive to Pensacola around twice a year on average. This frequency of travel has allowed me to see many sights along the way and has led to the desire to to visit a few regular stops along the way. So join me if you will for a virtual look at some of the things worth stopping at during the nine hour drive from Houston to Pensacola. Petting Minou is one of the things that makes driving to Florida worth it. The first stop on our journey east is a stop in Louisiana. For those of you who have never been to Louisiana let me start by saying the lower portions of the state consists of a lot of swamp area and a lot of bridges over those swamps. One of my favorite places to stop along the way is a Welcome Center in the middle of the Atchafalaya Basin. The bulk of the basin falls between Lafayette and Baton Rouge and is also known as Cajun Country. The Welcome Center provides an inside look into the history of the Cajuns and their exile from Canada to the Louisiana swamps. If you have the time it is definitely worth the stop. Plus, as one of the few rest areas along the 23 mile bridge there are other good reasons to stop there. 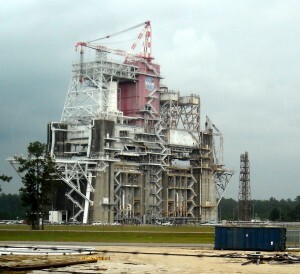 Rocket test stand at Stennis Space Center. 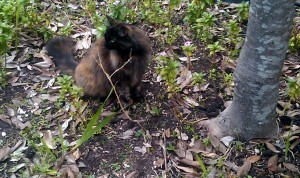 And if you do stop there be sure to say hello to Minou (pronounced me new) the cat. Minou is a sweet kitty that has welcomed me for many years now and I always take time to pet her on both the eastern and western legs of the journey. The next state on the eastern journey is Mississippi. 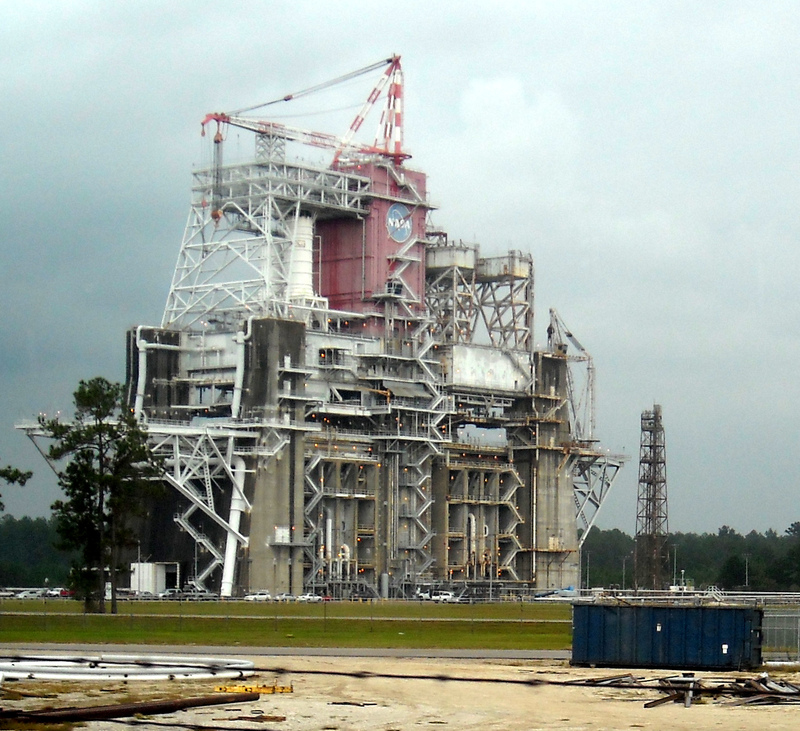 On the western border to Louisiana is Stennis Space Center. At the Mississippi Welcome Center there are many space related items to see as well as a new science center named Infinity to check out. Again, if you have time to see it the tour of the rocket test stands is definitely worth taking. After leaving Mississippi behind it is time for Alabama. To be honest I usually just drive right through Alabama since it only takes about a half hour to cross through. There is a very nice skyline and a tunnel in Mobile to check out while driving by though. Although I have never had the chance to stop there myself there is also a battleship exhibit in Mobile Bay that is worth a stop. During my last drive thru Alabama I was also greeted to the sight of the Carnival Cruise Ship Triumph undergoing repairs. 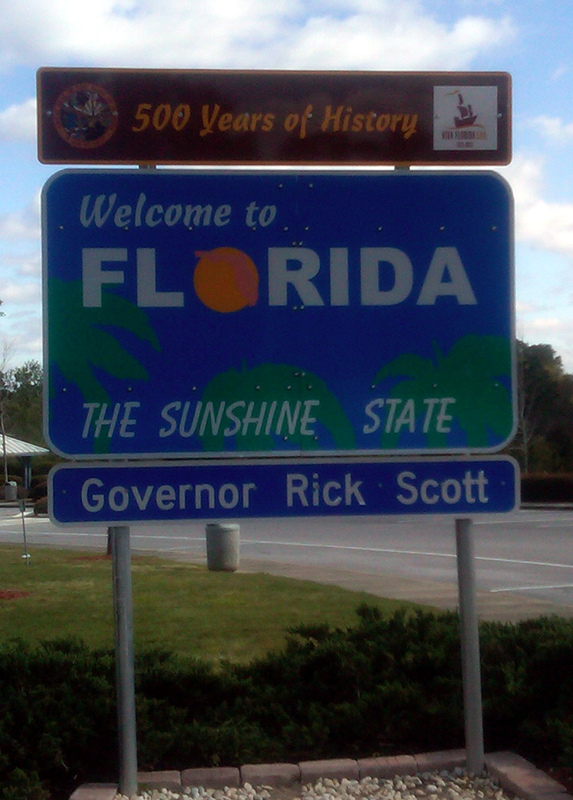 The sign that shows the journey is nearing its end. 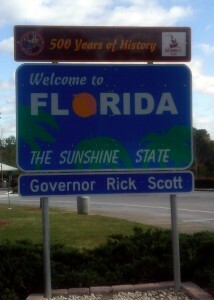 And then with Alabama in the rear view you reach the destination of Florida. A quick stop at the welcome center complete with free orange juice and a look at some former Blue Angels planes and it is just a quick hop skip and a jump to the shores of the Gulf of Mexico. 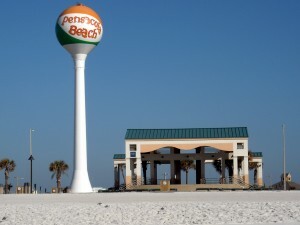 So, while Southwest’s announcement of non stop flights from Houston to Pensacola seems appealing at first glance I think I will continue my arrivals by car so I can enjoy all of the sights and sounds along the way. Besides what would Minou think if I flew on by without saying hi? Of course one of those quick wanna get away weekends a plane ride might be in the cards so I guess it is best to never say never. Now if you’ll excuse me I think it is time to plan another road trip. It has been said that when life hands you lemons you should make lemonade. Of course there are many kinds of lemonade. There is yellow lemonade, pink lemonade and my personal favorite the Arnold Palmer kind which combines lemonade with one of my drinks of choice iced tea. 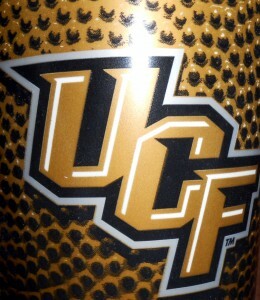 As refreshing as an ice cold Arnold Palmer would be right now this is not a piece on summer beverage choices. Instead, this is a piece on Space Center Houston getting some gently used items that it hopes will prove popular with the locals and tourists alike. But before we get into the new items coming to town we need to look at some history that got them in this position. Space Shuttle Endeavour atop the Shuttle Carrier Aircraft at Ellington Field Houston on its way to retirement in California. Once upon a time there was a Space Shuttle that flew missions to low Earth orbit for 30 years. Upon retirement of the Space Shuttle Program the surviving orbiters were sent to various museums across the country to inspire future generations on the joys of space travel, etc. 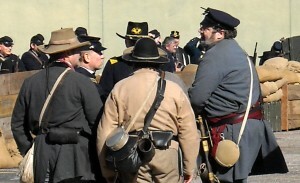 Early on in the process certain front runners emerged for the final resting places for the vehicles. In the game of shuttle musical chairs there were way more suitors than available Shuttles to go around. It was a given that the Smithsonian’s National Air and Space Museum would get one. So Discovery was sent to Washington D.C. leaving two flown shuttles and an early test glider left up for grabs. Space Shuttle Discovery shown prior to a 2009 launch has retired to the National Air and Space Museum in Washington D.C. and not in Houston as some had hoped. 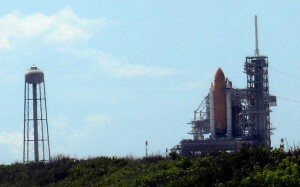 Florida was the next suitor to be given its own vehicle since few could argue that the site of every single Shuttle launch deserved to have one of its own on permanent display. So Atlantis was given to the Kennedy Space Center Visitor’s Center. At this point the people in Houston were giddy in anticipation since that meant that they would get the newest Shuttle in the fleet to call their own. The giddiness was short lived however as Endeavour was given to California to display. While an unpopular decision in Houston it made sense that the state where the Shuttles were built should have one. Plus, a Shuttle on the west coast opens up the viewing to a whole new population that might never make it to see the vehicles on the east coast. And despite the popular Toyota commercial that shows a pickup truck towing Endeavour over a bridge in Los Angeles it actually spent the bulk of its cross country trek on top of a modified Boeing 747 airplane; but more on that in a bit. With only Enterprise left in terms of Shuttle inventory available the people of Houston resigned themselves to the opinion that a test glider that never made it to orbit was still better than nothing. But then in a shocking development Enterprise, which had to leave the Smithsonian to make room for Discovery’s arrival, was put on a barge and shipped to New York to be placed on the deck of an aircraft carrier. Nothing says see the Space Shuttle in its natural habitat like placing it on the deck of an aircraft carrier floating in the Hudson River. As a side note Enterprise sustained some damage on the deck of that carrier during Super Storm Sandy. 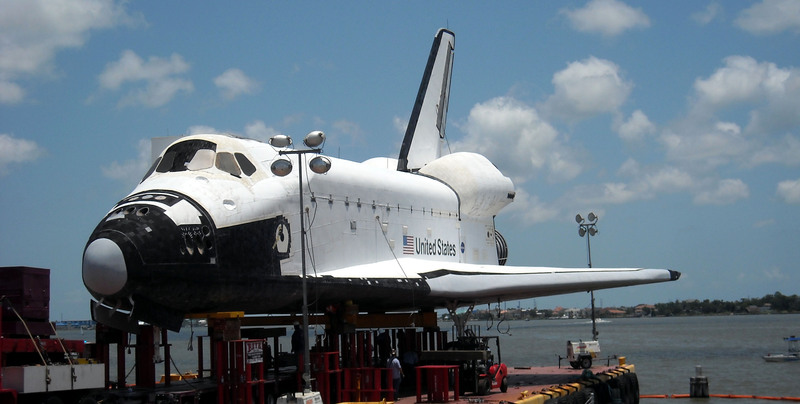 So with all of the shuttles claimed and Houston still without anything to place outside their Space museum the people of Florida did them a solid and offered to give them a mock up of the Shuttle that had sat outside of KSC for many years. After all, why be greedy and keep a full size mockup of a shuttle when you are getting a real Shuttle? Another side view of the Space Shuttle mockup. 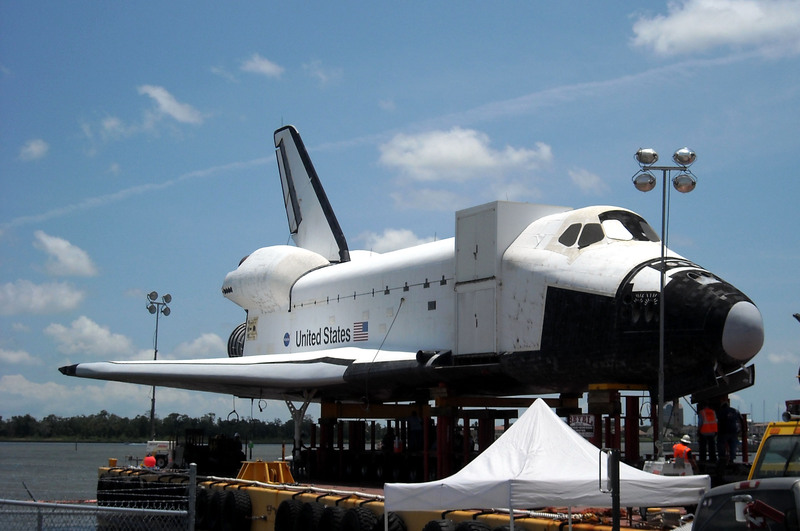 So with all of the pomp and circumstance that they could muster the Shuttle mockup called “Explorer” left KSC and was shipped on a barge around the tip of Florida and across the Gulf of Mexico all the way to the Johnson Space Center. Upon its arrival the mockup, that I affectionately call Balsa Shuttle based on it being made out of many wooden components, received a hero’s welcome and was considered better than nothing among the people of Houston. 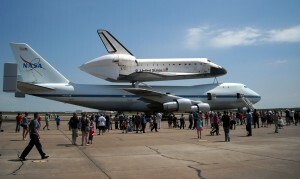 Are there still people in Houston who feel slighted at not getting a real Shuttle? Sure. But based on the numbers of shuttles available one can simply not fault the selection process of the sites with the exception of maybe New York. Although a case could be made that New York allows people from Canada better access to it and the Canadian Space Agency (CSA) has long been a supporter and partner in the Space Shuttle Program. Shuttle Carrier Aircraft NASA 905 will be disassembled and moved to a permanent display paired with Space Shuttle mockup Explorer in 15 months. 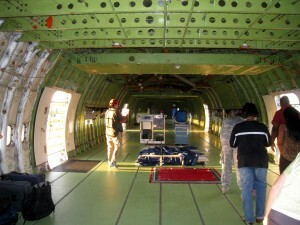 Inside view of the Shuttle Carrier Aircraft. So with our history lesson complete let us look to the future and that lemonade making with leftover parts and pieces. 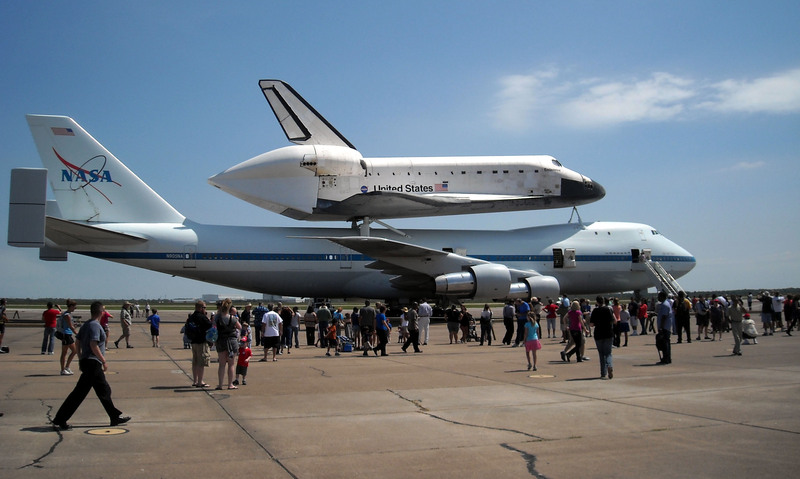 It was announced earlier this month that the Boeing 747 used to carry all of the shuttles to their final resting places has been given to Space Center Houston for display along with the shuttle mockup. Shuttle Carrier Aircraft (SCA) NASA 905 is one of two SCAs used for approach and landing tests early in the Space Shuttle Program. The planes were later used to return the orbiters to Florida whenever they landed in California. The plane also made a stopover in Houston with Endeavor on board to allow the people of Texas to see a real shuttle up close one last time before it was ferried away to California for that date with the little towing Toyota that could. 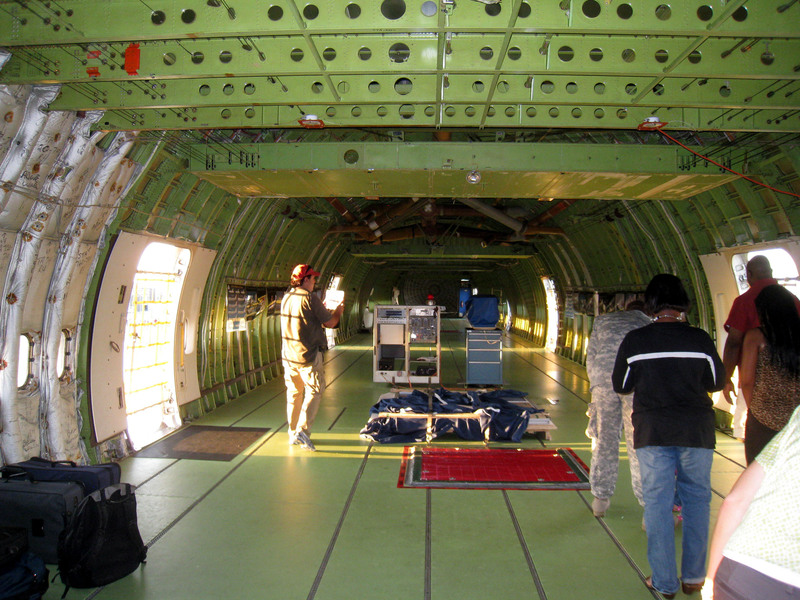 From this angle the interior of the SCA looks like any other 747. 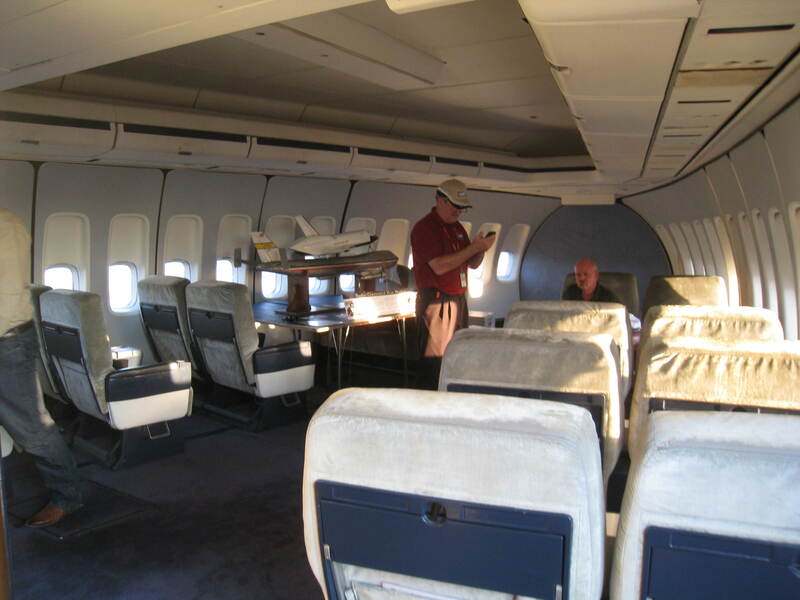 So, what does one do with a wooden Shuttle mock-up and a modified Boeing 747 that used to haul real space shuttles? They make plans to display them together in a nine story tall ferry flight configuration outside of Space Center Houston for visitors from across the globe to see. Is it an ideal situation? No. But given the “lemons” they were given it should make for as sweet of lemonade as possible. I have had the opportunity to be inside the Shuttle mockup as well as the SCA before and if the exhibit is done right it should really let visitors see a unique perspective. 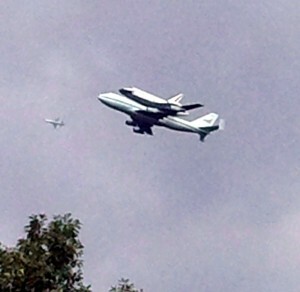 Space Shuttle Endeavour heads off to California. 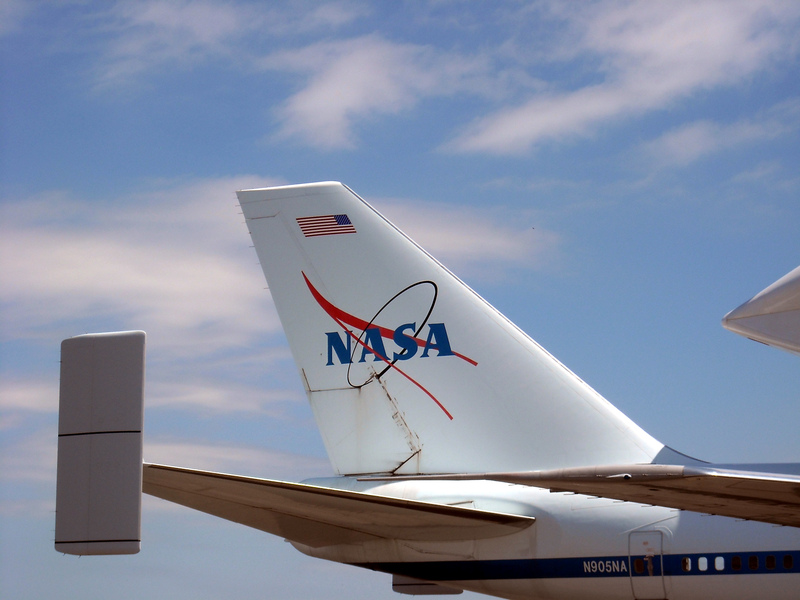 The plane carrying it returned to Houston shortly afterwards to prepare for retirement as a shuttle mockup holder. Current plans call for visitors to be allowed inside the SCA as well as the cockpit of the mockup so they should offer some pretty cool views into the Shuttle Program. But don’t make those plans to travel to Houston to see it just yet. Current estimates have completion of the ferry flight configuration display at least 18 months away. And to anyone with lingering bitterness of being passed over for a real shuttle resting place I say to at least try the lemonade before constantly sucking on that lemon. Now if you’ll excuse me all of this talk about lemons and lemonade has made me thirsty. Where did I put that pitcher of lemonade anyway? The other night Toronto Blue Jays pitcher J.A. Happ endured one of the most viscous hits I have ever witnessed a player take. No, the hit was not from a batter charging the mound. This hit to the left ear came from a baseball hit with enough force as to still travel nearly the length of the field after impacting Happ’s skull. The impact of ball on skull was also so violent that the sound could be heard all the way up into the press box at Tropicana Field. 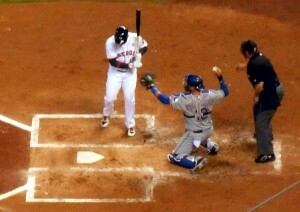 Former Astro turned Blue Jay J.A. Happ was hospitalized overnight after he was hit in the head with a baseball. Granted one could argue that sound travels further in a dome but still picture the type of force required for the sound to be heard that far away. During my years covering high school and college football I witnessed many violent hits. On a few occasions I even heard bones break and tendons snap so I know the sound of agony when a player goes down. I just don’t expect that sound to occur in a Ballpark at the rate that they seem to be occurring lately. Thankfully after an overnight hospital stay J.A. Happ was released and the 11 minute delay in the game that had thousands of fans silenced and players on both sides looking on with concern and disbelief will become just another footnote in the saga of near misuses and one of those viral videos that is passed along. The video may even make one of those compilation shows that ranks the top hits in sports, etc. Sadly, unless something is done the next pitcher to get hit in the head with a baseball off the end of a bat may not be as lucky. 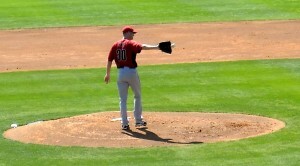 To its credit Major League Baseball is looking into ways to make the pitcher safer out on the mound. Cap inserts made out of Kevlar, the same material that bullet proof vests are made of, are being looked at as a potential way to protect a pitcher. 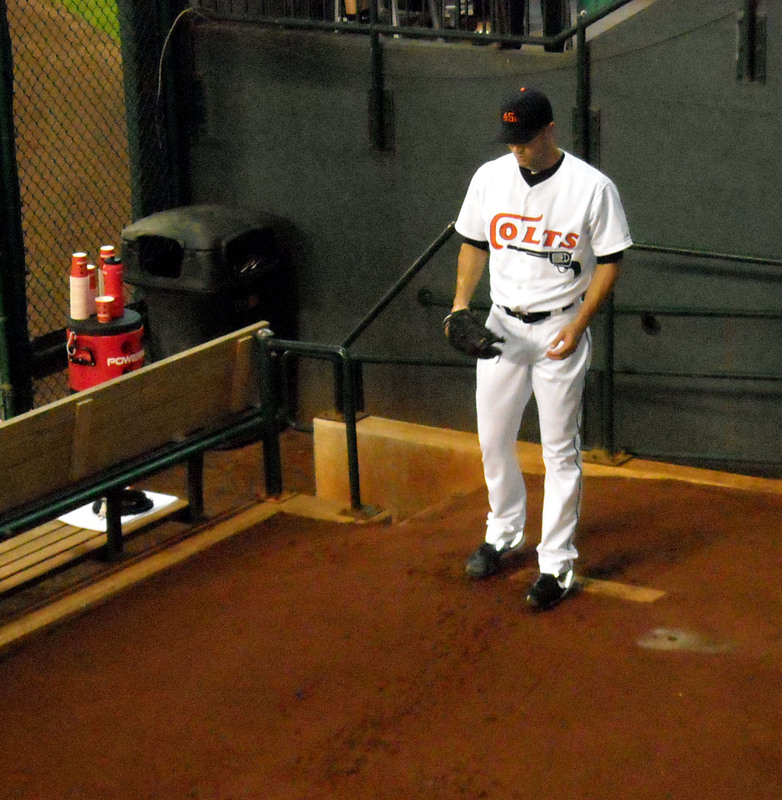 Pitchers like J.A. 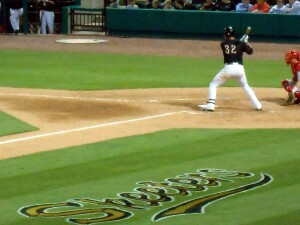 Happ are often sitting ducks for well hit balls back up the middle. Sometimes they are caught and and other times injuries result. Unfortunately a Kevlar insert would not have protected J.A. Happ from injury nor would it have likely prevented an injury last season that led to a pitcher for the Oakland Athletics undergoing emergency brain surgery to deal with a fractured skull and a life threatening hemorrhage since both of those impacts occurred below where the Kevlar would be placed. Since we at the Triple B Gigaplex are in the problem solving business here are some ideas for Major League Baseball to consider to protect the defenseless pitcher on the mound. With the understanding that the solution needs to protect the pitcher’s entire head while still allowing full range of motion to perform pitching duties like throws to the plate and pick off attempts, a catcher’s mask and goalie style mask are ruled out as options. While they would meet the criteria of protecting the pitcher, I an picturing a lot more stolen bases coming as the pitchers would lose most, if not all, of their peripheral vision and base runners would have a field day stealing on them. 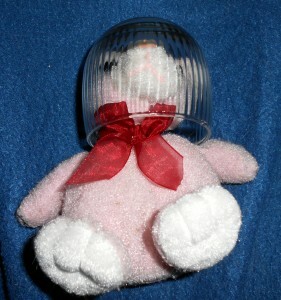 Okay, so the goalie mask style is ruled out which leads us to the perfect solution, bullet proof glass aquarium heads. I mean if the Miami Marlins can install aquariums behind home plate that can withstand the force of balls being hurled against them surely the same technology in smaller scale can protect the pitchers. Breathing holes will of course need to be drilled into the aquarium bowl helmets to ensure that pitchers can breathe and also not fog up the glass but it certainly answers the visibility issue and would prevent the rise in stolen bases that the other solutions would lead to. An early design concept for a protective pitcher fishbowl. All kidding aside, I am of course not seriously thinking that the solution to protect pitchers is a fish bowl helmet. And it may turn out that there is no solution that will protect 100 percent of the possible injuries. There always has been and always will be risk of injury related to sports. And as some athletes have famously said is why they are paid the big bucks. Take the NFL and NASCAR for example. 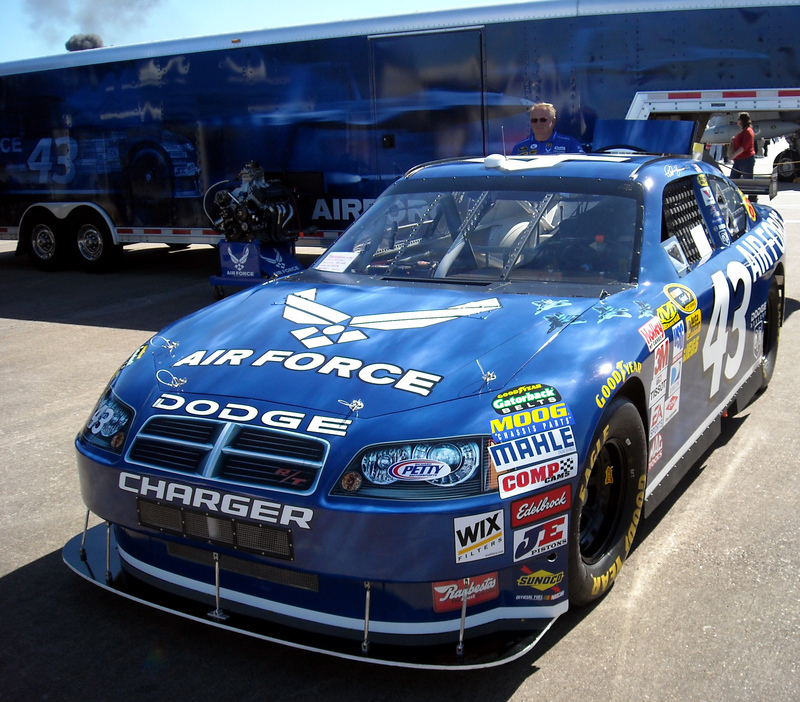 Both sports have spent millions of dollars on driver and player safety. Does that mean that athletes in those sports will no longer need to fear injury? Of course not. But it does mean that the sports are safer than they were say 50 years ago or so. The same is true with baseball. Experts will put their heads together and conduct trials to determine what if anything can be done to protect players on the field from injury. Regarding injury to pitchers whatever solution is found will need to be started at the Little League level to ensure that players are used to the protective equipment before reaching the majors. To think that a solution can be found this year and rolled out to all pitchers in the Major Leagues is just not going to happen. Even if the technology is available pitchers will still be able to choose whether or not they want to wear the equipment and in many cases the answer will be no since it will fundamentally change how they pitch and will add an unknown variable to the equation. J.A. Happ was lucky and evaded serious injury and will likely pitch again. 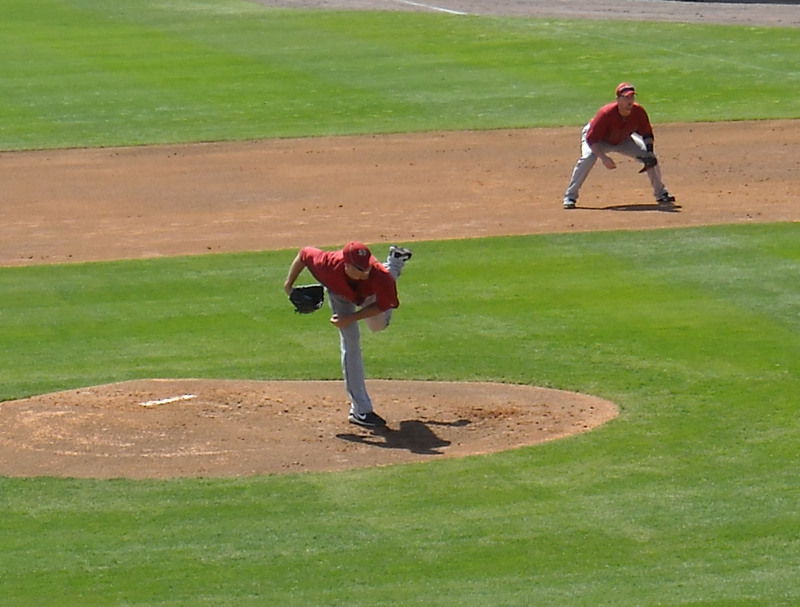 Time will tell if the next pitcher knocked down on the mound is as lucky. Incidents like J.A. Happ’s injury will unfortunately continue to be part of the game for the foreseeable future and most pitchers accept that risk and try to keep the fear of getting hit out of their thoughts. A few more viral videos of pitchers taking balls to the head though very well could change the culture sooner than perhaps anyone is ready for. And heaven forbid a player is killed on the field from injuries received. A few years back a minor league first base coach was struck in the head by a ball and died from his injuries. Following his death first and third base coaches were required to wear batting helmets out on the field in all Minor and Major League Baseball games. 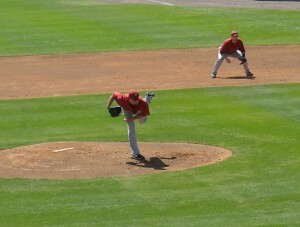 Of course no one is wanting that to be what finally ushers in the move to pitcher safety. So while there is no magic solution to prevent all injuries it is nice to see that the issue is being looked at in terms of a solution. Now if you’ll excuse me I am off to patent pitcher fish bowl helmets before someone beats me to it.